In the past, many Chief Information Officers at Small-to-Medium Businesses were just the top tech experts, ignored by CEOs. Today’s CIO is a business-savvy leader responsible for bottom-line results. But they may be surprised to find a significant business loss caused by their own departments. A recent survey conducted for Brother International by Clarus Research Group shows that poor allocation of centralized business devices can drain corporate profits. Compared with offices that have a greater number of shared printers, employees at offices with centralized copier/printers spend, on average, an additional three minutes each day on printing. Over the course of a year, this could mean an extra 13 hours spent at the printer. For a business of 500 employees, this could translate to 6,500 wasted hours. 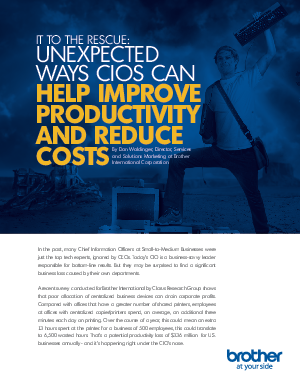 That’s a potential productivity loss of $336 million for U.S. businesses annually - and it’s happening right under the CIO’s nose.